This post has been sponsored by SC Johnson but all opinions expressed are my own. My children’s favorite treats during the summer are ice and yogurt pops. As a result, we end up with an awful lot of wooden sticks by the time September rolls around. In an effort to reuse as much as possible, I give the sticks a good rinse and store them in my art bag for future crafts. 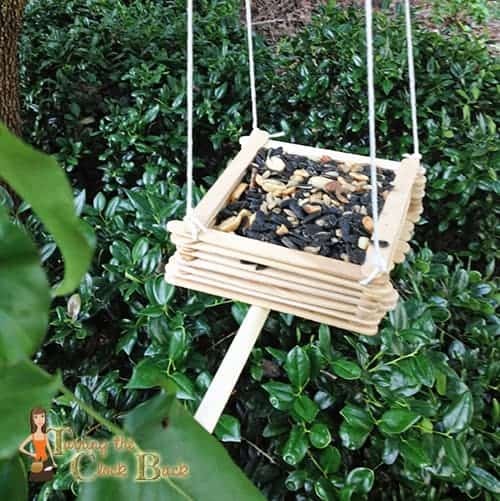 One project that caught my eye this month was this easy, DIY wooden bird feeder. Bird watching is a favorite hobby at my house and a great learning experience for kids to help identify bird species. If you too have a stockpile of wooden sticks, check out the instructions in my recent SC Johnson Greener Choices blog post to make your own bird feeder.